Meet the strange bedfellows against vaping: drug and tobacco companies, health advocates and Democratic lawmakers. A convergence of interests among these four lies behind the Food and Drug Administration’s (FDA) announcement on May 5 that e-cigarettes will be regulated as rigorously as tobacco beginning in August. Vaping advocates say the cost of FDA approvals will bankrupt an industry that might vastly improve public health. This spring, a major study from the Royal College of Physicians, the British equivalent of the Office of the Surgeon General, found e-cigarettes to be 95 percent less harmful than cigarettes. But many Democrats in Congress have long opposed unregulated vaping devices, which leave out tobacco itself and its carcinogens and instead vaporize a flavored liquid containing nicotine, which is derived from tobacco. Foes call e-cigarettes an enticement to children that could prove a “gateway” to tobacco. The divide on the left has been noted by Bill Godshall, founder of Smokefree Pennsylvania, a Democrat who sees vaping, while not risk-free, as a means of helping smokers quit. “The whole politics of this is decidedly left-wing,” he said. Those politics are opaque if not shrouded in smoke. Democrats’ de facto alliance with tobacco and pharmaceutical industry interests began with several halting legislative efforts to regulate tobacco in the 1990s, and gained momentum under President Obama, who initially had a Democratic Congress to work with. In 2009, the FDA won the power to regulate tobacco when Obama signed the Family Smoking Prevention and Tobacco Control Act. Before that, tobacco had been regulated by state and congressional measures, notably the 1998 Master Settlement Agreement under which states settled lawsuits against the tobacco industry over tobacco-related health-care costs. The connections between drug companies and anti-vaping Democrats can be seen fairly clearly in political money trails. The 2009 law centralized the regulatory regime, allowing the FDA to impose costly requirements and marketing and advertising restrictions on tobacco companies. The legislation was sponsored by Rep. Henry Waxman, Democrat of California and, Godshall said, presented in the Senate by Ted Kennedy of Massachusetts. While it was opposed at the time by tobacco giants RJ Reynolds and Lorillard, it was publicly supported by Altria, the parent of Philip Morris, America’s largest tobacco company—“to build a constructive working relationship” with the FDA, said an Altria spokesman, Brian May. Godshall said Altria “secretly negotiated” over the new regulatory regime with the Campaign for Tobacco-Free Kids, a public health advocacy group that also publicly supported the legislation. Altria also negotiated with a lobbyist for pharmaceutical giant GlaxoSmithKline, Godshall said. The Campaign for Tobacco-Free Kids did not return calls seeking comment. After the law’s enactment, it wasn’t long before it became the weapon of choice against e-cigarettes, which came on the market in 2007. An earlier FDA effort to regulate e-cigarettes as drug devices under the Food, Drug and Cosmetics Act, including seizures of shipments of e-cigarettes at ports in March 2009, failed when the case was thrown out of court in 2010. The new law gave the FDA the power it needed to “deem” e-cigarettes tobacco products and subject to heavy regulations. Once again Democrats led the charge. Senators Frank Lautenberg of New Jersey (who died in 2013), Sherrod Brown of Ohio and Richard Blumenthal of Connecticut were among the first to call for regulation of e-cigarettes. But the other beneficiaries were pharmaceutical giants such as Pfizer, Novartis, Johnson & Johnson and GlaxoSmithKline. They had spent $100 billion to develop rival smoking-cessation products, such as nicotine patches, gums, inhalers and drugs; and unregulated e-cigarettes had been eating into their market share. ntroduced less than a decade ago in the U.S., e-cigarettes are now about half the large and growing smoking-cessation market. Transparency Market Research predicts that, globally, it will grow to $16.02 billion by 2019 from $6.4 billion in 2014. Political contributions of tobacco companies have been hard to track since the 1998 Master Settlement with the states, according to the Center for Responsive Politics. Tobacco companies have shifted their focus to political action committees and anonymous donations allowed under the Supreme Court’s “Citizens United” ruling. But the connections between drug companies and anti-vaping Democrats can be seen fairly clearly in political money trails. For example, Lautenberg, one of the first to speak out against vaping, took $473,122 in donations from drug industry groups, according to OpenSecrets.org, a database of campaign finance. Lautenberg got the biggest chunk of the cash—$131,450—in 2008, just as he called for regulation of vaping. At the time, the average donation to Democrats from the pharmaceutical and health products sector was $15,130. Massachusetts Sen. Ed Markey, who declared that e-cigarettes “should be put out of business,” took a lifetime total of $445,750 in campaign and political action committee donations, according to OpenSecrets, with the biggest spike in 2014, just as he began to speak out. Other prominent anti-vaping Senate Democrats, such as Ohio’s Sherrod Brown and Connecticut’s Richard Blumenthal, took $479,624 and $131,550 respectively. None of the senators responded to requests for comment. Seen as pro-business, Republicans have also received drug company money—in many years, more than Democrats, particularly when President George W. Bush’s administration pushed through a prescription drug program for the elderly. But Republicans were not the top recipients when critical anti-vaping legislation passed and have not spoken out against vaping. Another way the left aligns with corporate interests is when pharmaceutical industry lobbyists become Obama administration regulators or vice versa. A case in point is the FDA’s present commissioner, Dr. Robert Califf, who has represented nearly every pharmaceutical giant with a smoking-cessation device on the market. Godshall says Califf’s leadership violates the president’s campaign pledge to curb the influence of lobbyists and could account for the regulatory blizzard against vaping. Godshall also charges that the chief tobacco regulator at the FDA, Mitch Zeller, has similar potential conflicts of interest. He said Zeller helped craft the 2009 Tobacco Control Act while working as a lobbyist/consultant for GlaxoSmithKline. Asked to comment on such potential conflicts, an FDA spokesman, Michael Felberbaum, declined. As the anti-vaping alliance solidified, Republican opponents began to embrace e-cigarettes as a cause. Rep. Duncan D. Hunter of California openly vaped an e-cigarette on the House floor in 2015 to show his support. Grover Norquist, founder of Americans for Tax Reform, told the American Media Institute that the vaping issue could help swing the 2016 election. E-cigarettes, he said, are not so much a product as “a movement,” a bellwether of a new consumer-driven economy. 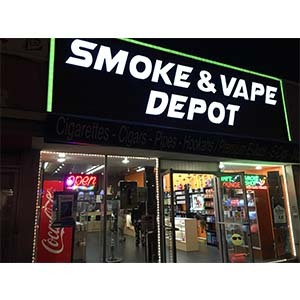 “The average people who vape are in their mid-twenties,” said Los Angeles Vapor Delight shop manager Marianne Smith. “It’s not teenagers. It’s often mixed couples where one smokes cigarettes and the other can’t stand the smell, so they compromise by vaping. “They spend about $10 to $50 per visit,” she said. Other buyers, she said, were 40- to 50-year-olds desperately trying to quit. Neither Smith nor other vape shop owners interviewed by the American Media Institute discerned political preferences but they said vaping was intensely important to their buyers. Last year, voters ousted a New Mexico state legislator who sought e-cigarette taxes. “Vapers already have a scalp,” he said. This story was reported by the American Media Institute.